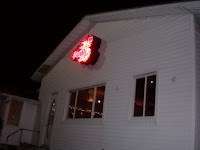 This place is a Rich family favorite and was often frequented by Dan's late grandmother Lolly. The whole family has amazing memories of dining here and we chose to continue the tradition yet again this year. While a lot of seafood places could have a rather stuffy vibe, this place is not like that. Instead, I'd describe it more as a rustic lobster house where anything goes--meaning that you can dress up or down. Accentuating the natural surroundings here, you'll find one of the coolest--and biggest--fish tanks, resting right in the middle of the restaurant. We once had the pleasure of dining at a table next to the fishies and were fully entertained. The reason that we look forward to coming here so much is of course the lobster. Click for menu. Simply put--it's outstanding! But even before diving into our lobster experience, there's a medley of deliciousness that precedes the main course. First off, the bruschetta they put out for the table always hits the spot. It's tangy, a bit on the tart side and topped with crisp basil. The refreshing mixed green salad is yet another hit. And although it consists of the usual, baby spinach, romaine, cucumbers and tomatoes, what makes it special is the creamy raspberry buttermilk dressing. We continue our gorge-fest with appetizers such as the escargot, crispy calamari and clam chowder. All three are amazing and if you haven't yet tried escargot, I strongly urge you to reconsider. Besides the delicious snail part which actually tastes more like calamari, the surrounding puff pastry crust is incredibly flaky and buttery. In my opinion, you can never go wrong when putting anything in a pastry crust. Now for the lobster. 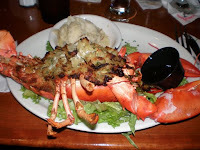 I wholeheartedly stand by my favorite--the crabmeat stuffed lobster. The crabmeat is super-rich and creamy--I never leave even a little bit on my plate. 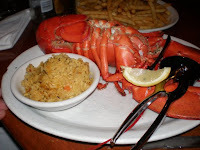 And once you get to the lobster part, well that's just where the fun begins--I especially relish finding a significant piece of lobster meat, dipping it into the sweet butter and then just closing my eyes and smiling. That's the good life! We have yet to be disappointed in the service department. The food comes out efficiently and is always fresh and hot. I have to say though that the waitstaff is so abundant sometimes, it's hard to tell who our main server is. Cost-wise, this place can break the bank, especially if you're with a big group--but that's why it's a special treat! Appetizers range from $3.95 - $13.95 and lobster goes for $18.95 - $34.95, depending on the size. It is true what she says. The Station House rules. The Foodista never lies.